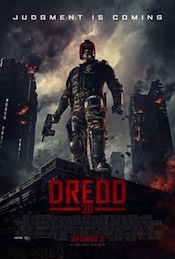 In this 2012 film adaptation of the long-running 2000 A.D. comic Judge Dredd – originally filmed in 1995 with Sylvester Stallone in the title role – a dystopian post-apocalyptic metropolis must rely upon the eponymous enforcer (Karl Urban) to single-handedly eradicate a deadly drug-dealing gang and bring to justice the woman who controls them. BAFTA-winning Scottish composer Paul Leonard-Morgan, who garnered stateside attention with his music for the Bradley Cooper thriller Limitless, infects Dredd with a hard-driving, adrenaline-injected electronic pulse, an underscore equal parts post-punk electronic rock and ‘80s/’90s style industrial metal. The result falls somewhere between a decaying, futuristic rave and revisionist Rammstein, tracks like "Cornered and Undefined Space" troweling on the tension and suspense which heavier tracks like "The Plan," "Order in the Chaos" and the guitar-driven "Taking Over Peach Trees" pay off with unrelenting fury. A dark, rocktronic beat that picks up and dissipates throughout, featuring electric bass and electric guitar. Opens with dark, throbbing electronics. A rock beat picks up with drum set at 0:52. A dark, pensive atmosphere created by distorted guitar effects and droning electronics. At 1:50 deep swelling drones introduce a terrifying build. A minimal bass beat comes and goes as electronic effects resonate eerily and electronic percussion builds and disappears. An abrasive rocktronic groove picks up at 1:06 with driving percussion, featuring electric guitar. Swelling electronic effects create a scary atmosphere. A tense, rocktronic beat, featuring electric guitar, is interrupted by sections of dark ambiance with a distant back beat. Opens with brooding drones and distant effects that slowly become more prominent. Abrasive percussion enters at 1:02. Distant, atmospheric electronics are joined by a techno beat. Abrasive electronic beats are accompanied by electric guitar and electronic effects for a mild house feel. Harsh distorted guitar fades to strange electronic effects creating a dark, electronic atmosphere. A crunchy rock groove featuring electric guitar and rock beats with a mid-tempo drive. Dark, electronic beats lead to an eerie, dreamlike atmosphere with ethereal drones and echoing voices. Opens with an electronic house beat and picks up with rocktronic electric guitar and percussion. Distant, electronic beats and ominous effects create a mysterious atmosphere. Heavier beats come and go throughout. Distant electronic effects are followed by an aggressive rock groove that fades into another dark atmosphere. Airy electronics create a mystical, serene atmosphere with breathy voices and occasional electric guitar riffs. A mildly driving, rocktronic groove that slowly builds in an eerie, ethereal atmosphere.